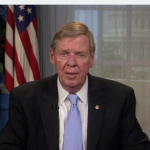 Senator Isakson explains why the U.S. needs a different healthcare system — one focused on exercise, good nutrition, and adequate amounts of sleep and rest. To understand that health care should, first and foremost, be about the patient. Johnny Isakson is a businessman who has built a respected record of public service to the state of Georgia. As a public servant, Mr. Isakson served 17 years in the Georgia Legislature and two years as chairman of the Georgia Board of Education. Mr. Isackson then served three terms in the U.S. House and is now serving his second term in the U.S. Senate.